I only meant to skim a few pages, jot a few notes, and then write up a quick review before starting on a pile of new books I've been meaning to read. Last summer I read the entire series and I didn't think I should waste another week on a book I'd already read. . . but, then I couldn't stop reading and before I knew it, I was devouring every line like a fat kid eating chocolate cake. It was too good to stop! 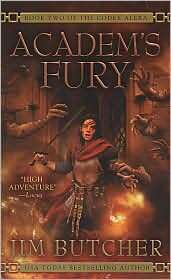 Book Two of the Codex Alera, Academ's Fury, is set two years after the first novel. Tavi is now in his second year at the academy and still without furies. He is in Cursor training regardless and serving as the First Lord's page. Life revolves around trying to pass his classes, avoid bullies, and get enough sleep. Butcher doesn't hold back in this novel and dumps on the reader political upheaval, invasion by a formidable and nearly indestructible enemy, unlikely alliances, and a touch of romance. You find yourself out of breath while you try to keep up with the action and the story. It is brilliant. In Book Two, we are introduced to a few more important characters including Varg and the Canim and the Vord. Much of the mystery surrounding Tavi is uncovered by the end of the story and you begin to see the good and the ugly of Gaius and his decisions as ruler. It is pretty obvious where Butcher is going with the storyline surrounding Tavi and his family, but he does it in a way that keeps the suspense moving (and keeps it moving through the last book of the series, I might add). Tavi's friends Max and Ehren join the story, as does Lady Acquitaine and Lord Kalare. An important undertone of this story is the Alerian reliance on their furies ? the ability to manipulate the energies that inhabit earth, water, air, metal, and fire to aid them in their everyday lives. Tavi is without furies and looked on as a freak, yet he proves that he is more than capable without them. As Book Two progresses, you start to wonder if the furies are actually holding the Alerian people back. Especially when using them becomes almost ineffective and dangerous against their newest threat ? the Vord. Butcher begins to hint at a deeper meaning here and as the series progresses you see his point developing into something of a life lesson. This book is a great read ? even if you haven't read the first novel in the series. The action is relentless and graphic; the characters relatable and endearing. One of the things I enjoy most about this book is that you have characters that you know are bad (Kalare, Vord), characters that you know are good (Tavi, Amara, Isana) and then there are characters that you want to hate, but you just can't. Characters like Lady Aquitaine and Fidelias. Or the characters that you want to love, but can't fully commit to that and instead waver between admiration and hate for them ? like First Lord Gaius. This is one of those books that sticks with you long after the last page is closed. It sticks with you like chocolate icing on your fingers and cake crumbs on your shirt. As a heavy genre reader, I love this series. I love you already, Paul. What other authors do you like? I just got started on Brent Weeks and Anne Bishop. Definitely a lot of variety out there.